Our product range includes a wide range of hepcfix 60mg tablets, hepcdac 60mg tablets, mydekla, daclahep tablets, dacihep tablets and dacihep 60mg. 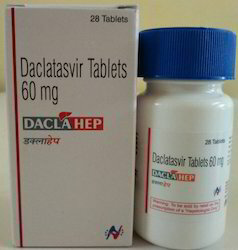 Daclatasvir 60mg is used with another antiviral medication (sofosbuvir) to treat chronic (long-lasting) hepatitis C, a viral infection of the liver.Daclatasvir 60mg tablet should never be used without sofosbuvir. 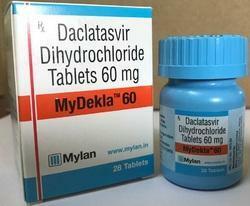 Daclatasvir and sofosbuvir may also be used with another antiviral medication (ribavirin). These medications together reduce the amount of hepatitis C virus in your body, which helps your immune system fight the infection and may help your liver recover. 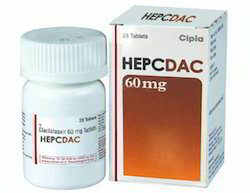 Chronic hepatitis C infection can cause serious liver problems such as scarring (cirrhosis), or liver cancer.Daclatasvir Price, Daclatasvir Cost.Daclatasvir Dose. Take daclatasvir exactly as your healthcare provider tells you to. · Do not change your dose unless your healthcare provider tells you to. · Do not stop taking daclatasvir without first talking with your healthcare provider. · Take daclatasvir 1 time each day with or without food. 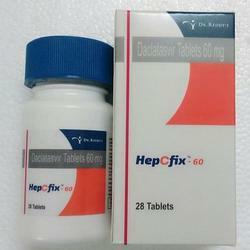 The recommended usage of daclatasvir to treat chronic hepatitis C virus is 60 mg taken orally once daily with or without food in combination with sofosbuvir. The recommended treatment duration is 12 weeks. Precaution: Before taking daclatasvir, tell your doctor or pharmacist if you are allergic to it; or if you have any other allergies. This product may contain inactive ingredients, which can cause allergic reactions or other problems. Talk to your pharmacist for more details. Store:. Daclatasvirroom temperature away from moisture and heat. 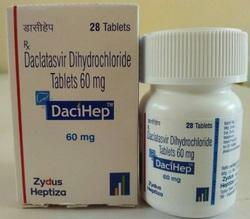 Daclatasvir is used with another antiviral medication (sofosbuvir) to treat chronic (long-lasting) hepatitis C, a viral infection of the liver. Daclatasvir should never be used without sofosbuvir. Daclatasvir and sofosbuvir may also be used with another antiviral medication (ribavirin). These medications together reduce the amount of hepatitis C virus in your body, which helps your immune system fight the infection and may help your liver recover. Chronic hepatitis C infection can cause serious liver problems such as scarring (cirrhosis), or liver cancer. Store:. Daclatasvir room temperature away from moisture and heat. Looking for Daclatasvir Tablet ?